Reflecting the essence of the world heritage Barron Gorge National Park, Kuranda Rainforest Retreat will remind you what it is to truly relax and unwind. Revitalize your soul amidst the tranquil surroundings, rejuvenate your body with luxurious Day Spa treatments and enjoy the tropical ambience of Northern Queensland. Kuranda Rainforest Retreat combines relaxation with adventure with a range of tour options. Ride the Skyrail, sail out to the Great Barrier Reef, experience the thrill of extreme White Water Rafting, or simply marvel at the beauty of the world's oldest rainforest, the Daintree. Relax by the pool, surrender yourself to the spa, saunas or healing health treatments available before preparing your senses for the gourmet dining experience offered at our Forest Fusion Restaurant and Bar. Choose from a range of fully self contained apartments in Kuranda or Balinese style villas with oversized Egyptian cotton daybeds and cushions, and the tranquility of our natural red cedar surrounds. Resort facilities include a day-spa retreat, spa pool, sauna and steam rooms, fully equipped gymnasium, floodlit tennis courts, and intimate theatrette. It is recommended that guests hire a vehicle for their convenience. At Kuranda Rainforest Retreat the choice is yours to be as active or to relax as much as you please. Kuranda, in Far North Queensland, Australia, is only 30 minutes from the Cairns CBD, yet affords spectacular views of the world heritage Barron Gorge National Park's lush rainforest and cascading waterfalls. Kuranda Rainforest Retreat is surrounded by World Heritage listed rainforests and within easy reach to one of the Seven Wonders of the World - the Great Barrier Reef. The Kuranda region has some of the most beautiful scenery in the World let alone Australia and some of the most exciting and diverse holiday locations you'll ever likely visit. Visit the Daintree World Heritage listed rainforest or swim or dive off the Great Barrier Reef. Take a helicopter flight to a secluded tropical island, go Hot-Air Ballooning, White Water Rafting, or solo skydive from 14,000 ft.
Our friendly staff can provide you with more information and will be happy to book your tour for you and arrange all necessary connections. Off-street car parking available free of charge. 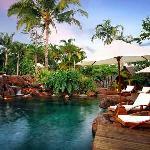 Hotel Address : 3 Greenhills Road, Kuranda, QLD, 4881. Spacious one or two level self contained One Bedroom Apartment with superior quality furnishings. The One Bedroom Apartment is fully air conditioned and comprises a spacious bedroom with 1 King Bed in the 1 level apartment or 1 Queen Bed in the 2 level apartment, kitchenette with stainless steel appliances, private bathroom, private laundry facilities, lounge room with cable television (Austar), in house movies, DVD player, Broadband & Dial-up internet access, Fax/Modem telephone line, comfortable Egyptian cotton daybeds and oversized cushions, dining area and individual decking for outdoor relaxation. Rate is for 2 guests. Maximum 4 guests. Extra guest charge $25 per night per guest. Children up to 12 stay free if using existing bedding. Cots are available at an extra charge of $10 per night. The perfect choice for a superbly comfortable stay. Independently located overlooking lush rainforest gardens, the Loft Villa features a spacious upstairs king size bedroom. Downstairs features a delightful lounging area including daybeds with oversized Egyptian cotton cushions, colour TV, cable TV with quality Austar channels, refrigerator, tea / coffee making facilities, air-conditioning, ceiling fans, ironing facilities and a spacious private bathroom. Rate is for 2 guests. Maximum occupancy is 2 guests. Cots are available at an extra charge of $10 per night. The villa features polished cedar flooring and light filtered through red cedar louvered windows. The spacious One Bedroom Villa provides air conditioned comfort with style. The villa comprises either a single level or loft queen size bedroom, spacious private bathroom, kitchenette (basic facilities), colour TV, Fax/Modem telephone line, dial up internet access, luxurious daybeds with over-sized stuffed egyptian cotton cushions, cable television (Austar), in house movies, polished timber floors underfoot and natural light filtering through cedar-louvered windows. Rate is for 2 guests. Maximum occupancy is 3 guests. Extra guest charge $25 per night per guest. Children up to 12 stay free if using existing bedding. Cots are available at an extra charge of $10 per night. Truly indulgent, spread over two levels, the 2 Bedroom Spa Villa is an independent villa providing two bedrooms (one upstairs, with a King size bed, & one downstairs, with a Queen size bed, for total privacy), a private spacious bathroom featuring a 2 person heated spa bath, a lounge area with over-sized Egyptian cotton cushions on luxurious day beds and a ‘hideaway’ where you can read, watch a movie through satellite television/in house movies or just escape. Equipped with Austar channels, air conditioning, ceiling fans, Fax/Modem telephone line, refrigerator, hairdryer and ironing facilities. Rate is for 2 guests. Maximum occupancy is 4 guests. Extra guest charge $25 per night per guest. Children up to 12 stay free if using existing bedding. Cots are available at an extra charge of $10 per night. Truly indulgent, spread over two levels, the independent Two Bedroom Villa provides two bedrooms (one upstairs, with a King size bed, & one downstairs, with a Queen size bed, for total privacy), one spacious bathroom, a lounge area with over-sized Egyptian cotton cushions on luxurious day beds and a ‘hideaway’ where you can read, watch a movie through satellite television/in house movies or just escape. Equipped with Austar channels, air conditioning, ceiling fans, Fax/Modem telephone line, refrigerator, hairdryer and ironing facilities. Rate is for 2 guests. Maximum occupancy is 4 guests. Extra guest charge $25 per night per guest. Children up to 12 stay free if using existing bedding. Cots are available at an extra charge of $10 per night.